Software Defined Datacenter will deliver the entire infrastructure of a data center in a virtualized form and will be delivered as a service. VMware vFabric promising Software Defined Datacenter (SSD) for more flexible compute, storage, network services to automate the control of the entire data center. 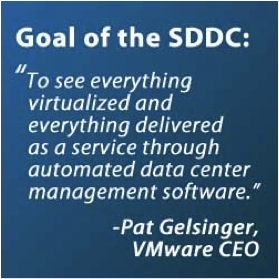 In this article we will go through both Software Defined Datacenter and VMware vFabric’s offerings. We published an article before – We Are Reaching an Age Where Computing is Defined by Software. Basic thing is that, in an ideal world, there is no need of any specialized hardware, which first to be installed by a consultant and then programmed in a specialized language; just have an application which can be define all the resources those are needed for a service, Software Defined Datacenter is actually just a piece of that way of thought. We already know about server virtualization and storage virtualization, and more recently software defined network (SDN), network virtualization. We will be gradually accustomed to the notion of software defined datacenter (SDDC). An infrastructure where all services are available upon request through automated and simplified management. The base of the vCloud Suite is an updated version of the virtualization platform vSphere 5.1. The performance of virtual machines (VMs) has been expanded and the network capability has attained a robust design, making the unplanned downtime towards nill. It supports up to 64 virtual CPUs, they can run continuously, vMotion has been enhanced so that VMs can now migrate without shared storage in real time. Today, on 3rd December, 2012, VMware has published an blog article named “VMware Releases 3 Major Advances Toward the Software-Defined Datacenter”. Cite this article as: Abhishek Ghosh, "Software Defined Datacenter and VMware vFabric," in The Customize Windows, December 4, 2012, April 26, 2019, https://thecustomizewindows.com/2012/12/software-defined-datacenter-and-vmware-vfabric/.